Akira has a medium built body, which shows that he isn't someone who can be that easily pushed around. His light-brown skin and reddish-brown, spiked hair, tend to make him stand out a little from the rest of the crowd, along with his height and his dreamy crimson eyes, making him more mysterious-looking. The aura he has around him, attracts people to him, though mainly girls and women. When he's by himself, he looks a little dangerous but more mysterious than anything, as he tends to frown while he's thinking about something, seeming angry even when he's pretty cool. When he's with friends though, he always has a gentle smile on his face, that seemingly brightens the room. His looks are well above average though, which causes girl to be easily attracted to him, sometimes to his annoyance as some pay too much attention to his looks than what he's saying. On all his clothes though, a black wing can be seen, as he marks all he wears with this symbol as it bring a sense of peace to his being. At first glance, Akira seems to be lost in thought, which is usually the case, as he always has something on his mind. Akira is a reserved guy, never too anything other than quiet. Once he doesn't feel a connection with whomever he's with or around, he is cautious around them, watching their every move while seemingly not paying attention.Even though he is somewhat suspicious of everyone he's not comfortable around, which is almost everyone, he never gives them the cold shoulder unless he deems it necessary to do so or they are deserving of it based on their actions. He tries never to judge person's at first glance as he feels its not fair, and though he tries his best, usually finds himself in trouble with troublesome fellows due to his strong sense of justice and their lack thereof. When Akira is around friends however, he is strict, not too strict, but strict enough that his presence demands attention. He sometimes lectures his friends when they blow things out of proportion or get into avoidable trouble, but he does it out of the kindness of his heart, so that they learn from their mistakes. Those around him trust him as he is a loyal friend and has never betrayed any of them, or given him reason to do so. When it comes to women, Akira has always been popular with them due to his looks and charm, but to him, looks aren't all that matters, but personality as he has no general dislikes when it comes to looks. Akira also has a slightly sadistic side to him that can only be drawn out in times of need, when he needs to kill without remorse. » Likes: Milk, Tea(any kind of tea), Dogs, Spirits, Women, Swords. From the day he was born, Akira had been hated by his his father, Hyato, who wasn't his biological father. Before Akira was born, his mother, Arika, and Hyato had had a fight, causing Arika to leave the house and country in her anger. Arika was a beautiful woman, and well known in the town for it. He long flowing black hair, full, soft lips, boyish-dress style, and medium build, drew men from all walks of life without her even trying. During this time, she had again taken up drinking, trying to drink her problems away and drown them in alcohol. For weeks Arika had spend her time in bars, making merry with the barkeeps and the other regulars in the bars she had been to. One day, a stranger entered 'Doc Hudson's Bars', famous for people drowning their woes in liquor and other things. The stranger had a presence about him, them seemed to draw others in, though he wouldn't give them so much as the time of day. Arika, slowing becoming interested in his quietness and endurance, challenged him to a drink-off. The man ignored her, but she wasn't going to give up that easy. After a few minutes of coaxing from the bar-mates and the barkeep, the man accepted the challenge and they both drank an enormous amount of liquor. Eventually, before the man knew it, he was spilling his guts out to Arika, who looked as if she was listening intently. To Arika, who had won the drink-off, nothing the man really said made it through to her, as she wasn't even sure of what was going on, but she knew one thing was for sure, that as time went on, the man slowly looked better and better over time. The man's name was Yamato Shinjiku, well, that's what Arika heard as they both tumbled down in her apartment bedroom, boisterously laughing and severely drunk. In that one night, they slept together, and by the morning, both had realized what had happened. Arika, feeling guilty for what she had done, questioned the man about himself,just in case something happened. The man simply told her what he had said to her the night before, and promptly left after he received a phone call from his work cellphone. Arika, still suffering from the hangover, was overwhelmed and confused by what the man had said, and decided that she had spent enough time away from her twin sons Hyaki, and Jisun. On her way home, she noticed blood along the walls and on the plants as she headed to the airport. Suddenly, something grabbed her from behind, hoisting her up into the air. She frantically kicked and screamed as she looked around seeing nothing for a time, before a white figure began to form before her. The disfigured creature that held her smiled as despair showed on her face, and laughed as she stopped fighting, looking on in horror as she moved closer and closer to its mouth. As her head entered its mouth, a blade was thrust through its head, emerging right before Arika's face. Arika fainted at this time, unable to take in all of what transpired, but felt Yamato's presence before awaking on an airplane. She was shocked as she had no clue how long she had been out for and how she got on the plane, which was now landing in her hometown. Months went by after this time, in which it was discovered that Arika was pregnant. Hyato, thinking it was his child, had made preparations with the town elders to create a sword for the child, as the town was well-known for producing swordsmen of high caliber. When the child was born, everyone knew that it couldn't have been Hyato's son, as the difference in their features were too great, along with the child's red hair. No one in Arika's or Hyato's family had had red hair, which enraged Hyato as he realized that his wife must have slept with another man. Hyato had motioned to kill the child, but Arika would not have it. She refused Hyato his wish for it's death and named the child Akira. Having already made the sword, Hyato hid it, and held his hatred for the boy throughout the 6 years that the boy lived with him, refusing to teach him any of the techniques of his family. Arika watched Akira grow in this harsh environment, still as strong as any of his brother's but his intelligence, ability to perceive and how he confronted situations was always better. Jisun, who was a little less of an outcast than Akira, always treated him with respect, as she truly saw Akira as his brother, while Hyaki, like his father, hated him, as Akira had shown him up when it came to their studies, as they were in the same class even though Akira was 3 years younger than him. Akira had been a straight 'A' student throughout all his years at school, earning him even more hatred from Hyaki, apart from the fact the he was way more popular with women that him. On the eve of his 7th birthday, Hyato took Akira deep into the forest in order to train him in the ways of the sword. Akira and Hyato spent hours in the forest, with Akira learning the basics of swordplay, before the dark of night rolled in. In a blinding flash, lightning split a tree nearby in half, igniting the dry forest floor, and bringing the dancing flames to life as they raced through the foliage, spreading throughout the forest. Both Hyato and Akira began to panic, as they ran through the forest, slightly ahead of the flames. As they ran, Akira looked upwards, only to see a man generate a bolt of white lightning from his hand at a creature seemingly coated in full white. The creature deflected the bolt, sending it towards Akira, who barely jumped out of the way. The bolt struck the trees before him, bringing them down in his path. Akira called out to his father who, when he saw the predicament Akira was in, smiled as he left him to die in the raging flames. The man noticed the boy trapped in the fire, and so did the creature, lunging towards him with a savage look in the black of its eyes. Quickly grabbing Akira, it moved through the fire, rushing away from the man. without a second thought, Akira stabbed the creature through its fingers, causing it to release him, Akira bouncing along the forest floor until he crashed into a nearby tree. In the time Akira had distracted the creature by stabbing it, the man took the opportunity to close the gap between them and slash its head in two. When the man turned to Akira, they boy was shivering with fear and tears running rivers from his eyes, but held his sword before him, as if ready to try to block his attack. The man laughed, then introduced himself as Yamato Shinjiku, but to Akira, that name didn't mean a thing as his mother hadn't told him his father's name. Akira in turn introduced himself, and upon telling the man his last name, the man realized that this was his son, as the boy resembled him when he was younger. The man saved Akira from the raging flames, then set him off near his house. Before the man had left Akira, he was told of what happened in the fire, and why he was left behind by his father. Yamato, feeling both guilt and responsibility for Akira, decided to train him, but did it much further in the forest. For 10 years, Akira was trained in the way of the sword, more specifically in the way of Iaido, learning numerous quick-draw techniques from Yamato, and how to apply them in actual combat, even with its obvious weaknesses, being able to overcome them after a while. Though his training wasn't complete, Akira was able to land a few superficial hits on Yamato, and held his head high as Yamato told him that he was ready to return home, and show his father how diligently he has learned in the forest. Akira smiled and slowly walked off towards home, remembering all the things Yamato had told him in his sleep, about Soul Society , hollows, the different creatures he had seen on his journeys and that Akira really was his son by right. Upon arriving back in town, dusk began to set, and no one identified Akira as the bot they used to know, due to his now well-toned body, height and overall appearance, looking as if he was a regular high-schooler who had just moved to the town. To Akira's surprise, the girls he knew before had grown up nicely, turning into real beauties, worthy of his praise. He entered the front yard and was greeted by the gardener, before going up to the front door. When he knocked, someone answered in response, then there was a slight silence, before a woman opened the door. Akira's were filled with tears the moment he saw her face, and he embraced her tightly. Arika was taken aback by the man's actions, but it wasn't until he had released that she realized that her son had come back from the dead. Arika feel to her knees with tears, as her joy overwhelmed her, shouting to Jisun to come as quickly as possible. Jisun, Hyato and Hyaki all rushed into the room to see what all the commotion was about, only to see a man embracing Arika. Hyato and Hyaki were a little puzzled by what was going on, but Jisun felt the man's presence and immediately knew it was Akira. Jisun welcomed his 'Zombie Brother' back to the world of the living, indicating to Hyato and Hyaki, that this was Akira. While Akira hugged his brother, he shot a piercing glance in Hyato's direction, sending shivers up his spine as he realized that the boy he had left in the fire had returned with a vengeance. Hyato moved towards Akira with a smile to embrace him also, but was avoided. Akira had no plan to left Hyato slide, but he wasn't going to hurt his mother either. Immediately, his presence seemed to change to something much darker, but then he stopped himself, and told his mother that Yamato sent his regards. Hyato, realizing that he was completely ignored, was ticked off, but not enough to let it show too much, as Akira spoke about his real father who saved him after he was trapped by the raging flames. Arika turned towards Hyato as she heard Akira's story, with tears in her eyes, as she was told that he was unable to save Akira due to a burning branch falling onto her son, killing him almost instantly. After his story, Arika spent a few hours locked in her rooms by herself, meanwhile Akira challenged Hyaki to a match, to prove which one of them should be the family swordsman, as tradition had it. Jisun had already given up on that title, and had headed towards medicine in the few years that Akira had been absent, so Hyaki thought there would be no objections to him taking up this title. The whole town gathered by the arena, as news of Akira's return buzzed all around, and the fact that he challenged Hyaki, who was now known as the best swordsman in the town. Hyaki accepted, as he knew he was better than Akira, who was new to swordsmanship, and was overdue, in his eyes, for someone to put him in his place. Silence fell over the stadium, as both contenders stepped into the ring, sizing each other up to look for opening. Akira stood still as Hyaki walked around him, getting ready to attack. As soon as Hyaki neared Akira's blind spot, he lunged toward Akira at full speed, but Akira wasn't surprised at what he did, as he would have done it as well if he was sure that he could defeat his opponent in one swift motion. Akira slowly spun as he noticed how fast Hyaki had closed the glad between them, with a look of horror in his eyes as he knew Hyaki would cut him down right then, right there. In a sudden flash, Akira was behind his brother, who had a large gash across his chest. Both Hyaki and the crowd were in awe as neither of them knew how Akira avoided the slash much less to counter Hyaki's slash. A medic team was quickly on the scene as there had been a few times that bones were broken, but never had it been seen that someone was cut so deeply with a wooden sword. The crowd was silent, as they all realized that Akira had become a beast in his own way, attacking swiftly and precisely whenever their prey let its guard down. Hyaki had been laying on the ground a few seconds before the medic team arrived, looking at his brother who had cut him down with no remorse, not even looking in his direction, but to the sky as if searching the skies for something. A few hours later, Akira was to be named as the head swordsman of the family, after savagely cutting down his brother. As Akira walked up towards the podium, he was met by his mother, who escorted him to it. As they walked towards the podium, his mother convinced him to leave this position to Hyaki and leave the town. The most convincing point she made though, was that he would have to stay here with Hyaki and Hyato, which she knew that he now hated, as well as the newfound fear everyone had for him. When he got to the podium, he announced that he wasn't going to take this position from his brother, and leave the town for good later on. The crowd was shocked, but applauded him for his thoughtfulness, as his brother had been dreaming of that position for years. Later on that day, Akira had been waiting for an airplane, as he was serious about leaving the town. As he watched the airplane land, he heard his name being called from afar. When he looked, he saw Hyaki and Jisun calling to him. When they got to him, they were out of breath, as they had been running from home, which was a great distance off. Hyaki, for the first time in his life, bowed before Akira, handing him the sword his father had made for him, as thanks for teaching him humility, while Jisun slung his bag over his back, and called to Akira as he boarded to plane. Akira returned the act of respect to Hyaki, taking the sword and boarded the plane. As the plane took off, he felt as if the broken bonds between him and Hyaki had been mended, as this was the first set of gifts they had ever exchanged with one another. Akira looked on through the window at the clouds as the plane rose above them, signaling the start of a new journey. When Akira arrived, he inhaled deeply as he was now in the place his mother had lived in as a child, 'Karakura Town'. He quickly enrolled in school, while his brother had gone off to be a doctor, as it was his dream to do so. After a few weeks of school, Akira was well known for being a polite guy, who was popular with girls, as his athletic ability was easily above par, and he wasn't a novice when it come to a sword. For him though, he knew he had to be prepared whenever another hollow came, if need be as his father had told him what would happen if there wasn't a shinigami or someone around who could easily vanquish the creature, get people to safety during its attack, which Akira had been somewhat prepared for. As the sun kissed the horizon, Akira felt a sense of justice, knowing that he would help to protect the school for any hollow or creature who dared to attack its students. He slowly stood up, thanking his father for his new found strength, and soon afterwards, he discovered his abilities. Of course, there were all new to him, but within a few days of practice, he had gotten the hang of how to use them relatively easy. Along with his daily routine of exercise and swordplay, he found time to practice with his abilities, enough to understand how they work and what they were capable of, knowing that they'd help in a tight spot, and be great if he needed a few utility measures. Akira fires of an extremely fast, transparent shockwave that passes through solid objects, slightly pulling/pushing it in the direction of the shockwave's path. Though the shockwave does do average damage, it can be used in many ways the it pulling effect can slow down the speed of an attack, and the fact that it can be fired off in rapid succession of 10 per post with a cool down of 5 posts. Normally, the shockwave can be used 2 per post. Akira generates a faint white aura around himself and/or a body that can have any of the following properties, but only one at a time. Note, the aura still remains after the allotted time, but without the abilities. Gold Aura - the colour of the aura changes to gold which indicates an increase in his defensive capabilities, increasing endurance and will power by gathering reishi around himself to create a thin transparent barrier while strengthening his resolve. While active, it decreases the cool down time of all his abilities by 1 post per 5 posts. Is able to last for up to 20 posts with a cool down time of 10 posts. Black Aura - The Black Aura expands outwards to the 5 meter limit, and disrupts the flow of reishi within 5 meters of Akira, causing all being made of such to weaken in there offensive and defensive capabilities, as well as projectiles. When Akira uses an offensive ability and if it lands a hit, the aura is absorbed into the attack, turning into a black energy of the sorts, being implanted into the target. If the target is made of reishi, the black energy begin to draw reishi towards the target, creating a transparent film of energy around the target strengthening their defensive capabilities slightly above the norm for 3 posts. After this, for another 3 posts, the the energy around them become extremely volatile, exploding upon contact with outside reishi, or another of Akira's abilities which trigger the black energy to explode, using the reishi gathered as a catalyst, therefore the more reishi gathered, the greater the damage. If the attack misses or doesn't land, the aura returns for 2 posts along with all its abilities. If no outside reishi comes in contact with the energy, then it simply fades away, and the black energy disappears doing no damage. Has a 12 post cool down time. Upon coming into contact with an object, Akira can move the object freely with his tele-kinetic powers, turning it into a weapon from which he can use his abilities. This power can be used in tandem with Sabato and DJango, giving it the ability to fire shockwaves upon his command and become cloaked when he deems it, in whatever colour aura he wants with the abilities of each intact. When he uses this ability, the object is marked with a small yin-yang sign that is usually hidden somewhere on it. This power can be undone by removing the mark through touch. 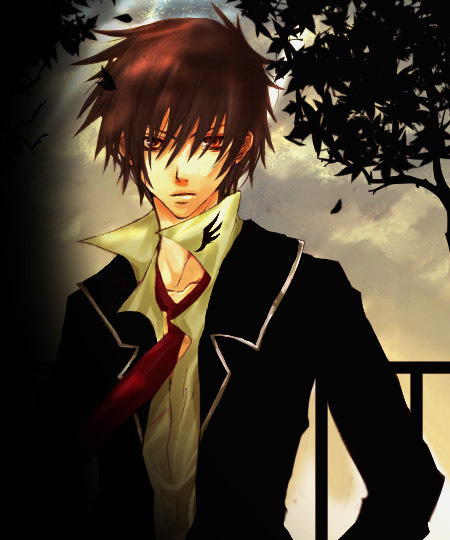 Upon entering Stage 1, Akira's left iris turns dark yellow in colour and his personality slightly twists, as he slowly begins to take pleasure in seeing others suffer, though he doesn't show it much. This ability creates an identical copy if Akira's current weapons, and coats his weapons in a purple slag. This substance slowly 's erodes the target's reishi and with each hit, the amount it erodes by increases. Akira can also cause the slag to explode by sending a wave of purple energy outwards, which would trigger the explosion, damaging targets infected with it, thus removing the slag their body. The slag cannot affect Akira in anyway. With every landed hit, 1 stack of slag is applied on a target(roughly about 0.5ml of plasma), and with every 50 stacks of slag, the damage is increased by 5% of initial damage. In this state, both Akira's iris's become dark yellow in colour and his personality becomes twisted, and Akira becomes a sadist, enjoying the pain others feel from their discomfort or pain. During this time, Akira finds it hard to differentiate between friend and foe. Akira generates a pitch black sphere within the palm of his hands. The destructive force of Eclipse is immense as when hits a target, aside form the damage it deals upon contact, then it behaves like a singularity, pulling all towards it before exploding, dealing additional damage to all within the range of them explosion. If the aura Akira dons at the time is black, the sphere can be left anywhere, pulling everything towards it and gathering reishi continuously for 3 posts, then, upon command, it can be set to explode, or upon contact with another being dealing massive amounts of damage. In this state, Akira finally comes to his senses but is taken aback by his past cruelty and would rather find a peaceful conclusion than fight. A black aura forms around himself which shrouds all of his abilities in it, and with it, his iris' turn silver as a sign of his evolution. Akira summons 5 ethereal blades which he can simultaneously control to do his bidding while being able to utilize his other abilities. The blades themselves can be destroyed, but will reform in 3 posts until the ability has come to its end. Through them, Akira can channel Sabato, firing multiple shockwaves in all directions with only a 5 post cool down to do so,though it takes up considerably more energy to do so. This can be said to be Akira's strongest offensive ability, utilizing all of his offensive abilities at once. Once used, the current number of ethereal blades doubles, and begin to spin rapidly around the target in a cage-like fashion, damaging all who come in contact with it. Three black spheres are then generated around Akira, who charges towards the target, at which time the cage begins to close in on the target in an attempt to forcibly immobilize them. If Akira lands a hit with any of the three spheres, the other 2 are drawn to it, fusing with the body and creating a fluctuating singularity, causing the ethereal blades to continuous assault the target from all sides, before all the blade hits the target simultaneously causing the spheres to all implode within the target dealing an extremely high amount of damage. The spheres can be made to implode upon command if need be, and if left within the target, without the command to implode or the trigger, one will implode every 2 posts dealing high amounts of damage with each implosion. This ability can only be used twice in any one thread, and after its use, leaves Akira in an exhausted state, lowing reaction time, strength, speed, and endurance, for 5 posts. Has a cool down of 20 posts. When Akira got off the airplane, he took in the air, savoring it all before continuing towards the the luggage area. He looked around with his eyes opened as wide as he could, making sure that he'd miss nothing. Suddenly, there was a blood curdling scream from within the plane, which created a wave of silence that hit all within earshot. Everyone watched the airplane, looking for some amount of movement, when the door was suddenly sent flying off its hinges, killing a few people when it landed and injuring a few more. Akira knew the reason for this, the hollow that was looking them right in the face. The was a sudden panic as one man was mysteriously lifted into the air, before his head exploded, creating a wide spray of blood which coated the onlookers close enough to the man. People rushed past Akira as he walked towards the creature, finally being able to test his abilities. When the area was cleared, only Akira, the hollow and a few stragglers had stayed behind, and the hollow seemed to smile. Akira rushed towards the hollow, as it did the same, ready to immobilize the hollow without any remorse. The hollow looked like a giant ape as came at full speed, swinging it arms at Akira's head. Akira, not thinking much of the hollow, made quick work of its arms, slashing them off then put some distance between himself and the hollow. The hollow laughed when it saw its arms, which puzzled Akira, as cutting off someone's arms was usually a painful experience for them, but the creature seemed to enjoy it. Akira rushed forwards again, hacking and slashing the creature, hoping to inflict some amount of pain and stop it eerie laughter. The creature just watched as Akira damaged its body, but it wasn't very concerned with what he was doing. Akira backed off, a little tired from using up so much energy, and noticed that the creature was just staring at him. "Are you ready to start now? ", asked the creature as it regenerated its arms. Akira was stunned to see the damage he had done just now, regenerated within second, and never noticed the creature swung at him. The impact sent Akira reeling into one of the loaders, injuring his right shoulder. For the first in a long time, Akira felt fear and a shiver shot up his spine as the hollow closed the distance between them. Disappear now clothed his face as Akira began to back away from the creature, before clutching his sword and getting to his feet. He swallowed hard and clenched his teeth but his feet wouldn't move. The hollow laughed as it scooped him up leaving his sword arm free, as he knew he was inexperienced when it came to hollows so it wouldn't matter. Akira struggled as he neared its mouth, tryin bb to break free, then for a split second, seemed to go blank. A flashback came to Akira, of when his father had saved him, and the fact that he had focused on slashing its head in two. Akira wasn't sure if it was a blessing or a curse that he was right before the creature' s face when this came to him, but he knew he had to act fast. With as much strength as he could muster, Akira slashed the hollow' s face, causing it drop him and cover it face, howling in the process. It took a few seconds for Akira to recover, but when he did, he was back with a vengeance. Taking advantage of the creature' s pain, Akira leaped atop the loader and towards the creature. By the time the hollow noticed what was happening, it was too late. Akira slashed through his face, almost splitting his head in half. He watched, half out of breath, as it fell to the ground beginning to disappear before his eyes. He smiled as this was just first step towards protecting those he came to love and all others from hollows. He quickly regained himself then made is way towards the direction he had seen his brother go off. He was done for the day, and thought he deserved some well needed rest so he'd be ready for the next time. Am finally finished. Could someone take a look at this for me? Lol, whats up Ludalfa? Long time no see. Hope I've done this right and up to scratch.